1. 10 mM BrdU (Sigma) in dH2O. Store at -80°C. These aliquots are good for several freeze-thaw cycles. Surprisingly, BrdU stock goes bad over time at -80°C and should be remade every couple of months. BrdU solution made fresh works best. BrdU is a mutagen and should be handled with care. 2. Mouse anti-BrdU monoclonal antibody (Becton Dickinson). 3. Cy3-Conjugated goat anti-mouse antibody (Jackson ImmunoResearch Laboratories). 4. 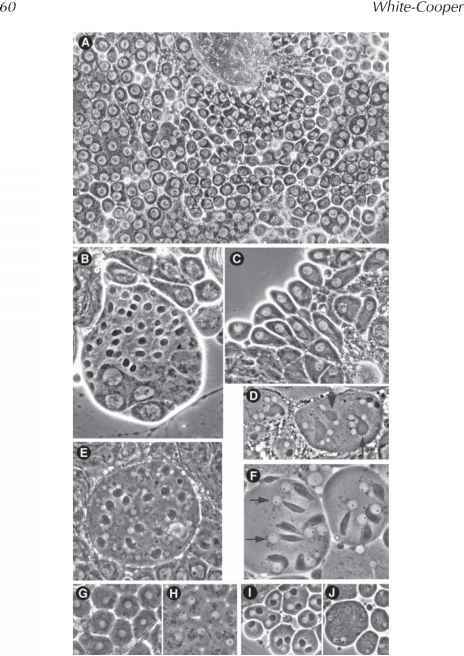 Glycerol-based antifade solution for mounting ovaries onto microscope slides such as Vectashield (Vector Laboratories). 5. Grace's insect culture medium (Mediatech) brought to room temperature. 6. 2 N HCl (8.6 mL concentrated 12 N HCl stock per 50 mL H2O). 7. 100 mM Borax neutralization solution: 1.907 g Na2B4Or10 H20/50 mL H2O. Sterilize by filtration and keep stock at 4°C to prevent mold growth. 8. Phosphate-buffered saline (PBS): 130 mM NaCl, 3 mM NaH2P04, 7 mM Na2HP04, pH 7.2. Sterilize by filtration or autoclaving. 9. Phosphate-buffered saline + Triton (PBT): PBS + 0.1% (v/v) Triton X-100. 10. PBT + BSA: PBT + 0.2% (w/v) bovine serum albumen (BSA). 11. PBT + normal goat serum (NGS): PBT + 5% (v/v) NGS. Heat-inactivate NGS at 55°C, 20 min, and store in aliquots at -20°C. 12. PBS + DAPI: PBS + 1 |g/mL 4'6-diamidino-2-phenylindole (DAPI) (Roche). 13. Buffer B for fixation: 100 mMKH2P04/K2HP04, pH 6.8, 450 mMKCl, 150 mM NaCl, 20 mM MgCl2. 14. 37% Formaldehyde stock (methanol stabilized). Fresh EM-grade formaldehyde (16%) without methanol can be substituted and volumes should be adjusted accordingly. 15. 5% BSA in dH20 (distilled water) for pretreating Eppendorf tubes and pipets to discourage sticking of the ovaries. 16. Two fine-tipped dissecting forceps, such as Inox 5 biologie tip (Fine Science Tools). 17. A deep glass dissecting dish such as a 9-well dish with wells that hold 1 mL of solution (Fisher). 19. Standard microscope slides, 22 x 22-mm2 #1 cover slips, and nail polish for sealing. 20. Low-power stereomicroscope for dissections. 1. Ultra centrifuge equipped with swinging-bucket rotor. 2. Ephrussi-Beadle ringers (EBR): 130 mM NaCl, 5 mM KCl, 2 mM CaCl2, and 10 mM HEPES, pH 6.9; autoclave and store at 4°C. 3. 5 mg/mL Collagenase (Type 1A Sigma) diluted in 1X EBR. 4. Nuclear isolation buffer: 15 mM Tris-HCl, pH 7.4, 60 mM KCl, 15 mM NaCl, 250 mM sucrose, 1 mM EDTA, 0.1 mM EGTA, 0.15 mM spermine, 0.5 mM spermidine. Sterilize with a 0.2-|im filter and store at room temperature. 5. 1X Nuclear isolation buffer with 1.5% NP-40. 7. Three solutions of 0.8 M, 1.5 M, and 2.5 M sucrose dissolved in nuclear isolation buffer. 8. 5-mL plastic pipet cut into 1.5-cm sections. 9. 2-mL Dounce homogenizer (clearance 0.0005-0.0025 in.) (Kontes). 10. 1-mg/mL stock solution of DAPI (4'6-diamidino-2-phenylindole). DAPI should be diluted in 70% ethanol. If the DAPI is diluted in water, it will precipitate over time. 11. 5% BSA in dH20 for pretreating pipets and tubes. 12. 10-mg/mL Stock solution of RNase A (Sigma-Aldrich) diluted in 0.01 M sodium acetate (pH 5.2). Heat to 100°C for 15 min to inactivate DNases. 13. 1 mg/mL Propidium iodide in water. Fig. 2. Flow cytometry (FACS) profile of ovarian nuclei from mature wild-type females. The numbers over the peaks correspond to the DNA copy number (C) of euchromatic sequences. The 2C-32C peaks are composed predominantly of follicle cell nuclei, but the less abundant nurse cell nuclei are also present in these populations. In contrast, the 64C-512C peaks represent only nurse cell nuclei. A blowup of these higher ploidy nurse cell peaks is presented in the right-hand corner of the graph. The 16C follicle cells have been gated (dotted lines) to be collected by FACS. 1. Three days before dissection, condition Drosophila females with males on wet yeast for 2 d, followed by fresh wet yeast for 1 d (see Note 1). 2. On the day of the experiment, bring enough Grace's medium to room temperature for dissection, incubation, and washes (approx 4 mL per sample). The tissue must not be chilled before or during BrdU incubation because this inhibits incorporation. Pretreat tubes and Pasteur pipets with 5% BSA to discourage the sticking of ovaries (see Note 2). 3. Dissect ovaries in 400 pL of room-temperature Grace's medium in the dissecting dish. After dissecting approximately six pairs of ovaries, puncture the ovarian sheath and partially tease apart the ovarioles at their anterior ends. At the end of this process, most ovarioles should be separated at their anterior tip but remain attached at the posterior near the common duct and uterus. Some mature egg chambers will rupture from the ovariole and break free. Do not be concerned by this. 4. Using a BSA-treated Pasteur pipet, transfer ovaries and free egg chambers from the dissecting dish to a BSA-treated Eppendorf tube. Allow ovaries to settle to the bottom of the tube for 30 s. Remove Grace's medium with a p1000 Pipetteman and add 1 mL Grace's medium containing 10 |M BrdU. This is prepared by adding 1 ||L of 10 mM BrdU stock to 1 mL of Grace's. Incubate for 1 h with rocking (as short as 15 min of incubation will yield detectable incorporation). 5. At end of incubation, remove Grace's/BrdU to hazardous waste and rinse the ovaries twice for 3 min (per rinse) in Grace's medium to remove unincorporated label. 6. Fix the ovaries in 1 mL of 6% formaldehyde/buffer B/dH2O (1 : 1 : 4 using 37% formaldehyde : Buffer B stock : dH2O) at room temperature for 20 min with rocking. 7. Wash with 1 mL PBT three times, 5 min each rinse with rocking. 8. Acid-treat the ovaries with 1 mL of 2 N HCl at room temperature for 30 min with rocking to denature DNA. Alternatively, DNA can be denatured by treating with DNase (see Note 3). 9. Remove the acid and neutralize the ovaries in 1 mL of 100 mM borax (sodium tetraborate) for 2 min. 10. Wash with 1 mL PBT three times, 10 min each wash with rocking. 11. Block the ovaries in 100 |L PBT/5% NGS for 30 min without rocking. 12. Remove the blocking solution and add 100 |L PBT/NGS with 1 : 20 mouse anti-BrdU monoclonal antibody (Becton Dickinson cat. no. 7580). Incubate at 4°C overnight without rocking. 13. The next day, wash with 1 mL PBT/BSA 0.2%, three times for 10 min each wash, followed by three times for 30 min each wash, with rocking. 14. Block the ovaries again with 100 |L PBT/NGS for 30 min. 15. Label with secondary antibody. Remove block and add 200 ||L PBT/NGS containing a 1 : 400 dilution of Cy3 goat anti-mouse antibody or other secondary antibody of choice. Mix gently. Incubate in the dark at room temperature for 2 h without rocking. 16. Wash in PBT (without BSA) as in step 13. 17. Remove as much PBT as possible and counterstain the nuclei in 100 |L of PBS containing 1 |g/mL of DAPI. Mix gently and let sit at room temperature for 7 min. 18. Remove the PBS/DAPI solution and add 80 |L Vectashield (Vector Laboratories) with a cutoff pipet tip. Gently mix by flicking the tube. Spin full speed in an Eppendorf centrifuge for 3 s. Mix again by flicking the tube but make sure the ovaries remain in the Vectashield. If the ovaries stick on the wall of the tube, spin again briefly. Allow the ovaries to equilibrate in Vectashield for at least 30 min before mounting. At this point, ovaries can be stored at 4°C. 19. Mount the ovaries on microscope slide for observation. With a cut off p200 pipet tip, pipet 23 |L of fresh Vectashield to the middle of the slide. With the same tip, pipet ovaries to one end of slide. Using forceps, pick desired ovarioles and egg chambers into the fresh Vectashield. It is important to transfer ovaries into fresh Vectashield to ensure protection from photobleaching in the microscope. Mount approximately one pair of ovaries per slide. Separate ovarioles completely at this point and remove excess ovary sheath. Spread out and align ovarioles in parallel by raking forceps through Vectashield. Pipet unused ovaries back into the Eppendorf tube and clean up excess Vectashield that remains on the end of the slide with a kimwipe. Place a 22 x 22-mm2, #1 cover slip on ovaries. If desired, place a light weight (approx 12 g) on top of cover slip for 3-10 min. This flattens the egg chambers so that more cells are in a single focal plane. Seal the edges of the slide with nail polish and allow to dry for several minutes. Optimal storage of the slides is in the dark at -20°C. 20. Observe incorporation on an epifluorescence microscope equipped with bandpass filters that allow the visualization of DAPI and Cy3 (excitation/emission wavelength (nm): DAPI approx 330/450; Cy3 approx 550/570). BrdU incorporation during mitotic, endocycles, and chorion gene amplification should be visible using a 10x objective (see Fig. 1A-D). Incorporation will be more apparent under higher-power, 20-100x objective, and an oil immersion lens is recommended. Nuclei should be brightly stained with DAPI, and a focus of more intense DAPI staining should be seen in the heterochromatic chromocenter of polyploid cells (see Fig. 1C). 1. Condition 30-50 females on wet yeast as described in Subheading 3.1. (see Note 1). Processing more than 50 females at a time may result in significantly increased background. 2. It is important to pretreat all materials that will come in contact with the nuclei with a 5% solution of BSA to prevent the nuclei from sticking. This includes Pasteur pipets, Eppendorf tubes, 2-mL Dounce homogenizer, step gradient tube, Pipetteman tips, and the 100-|im Nitex filters. This treatment will greatly increase your yields. 3. Dissect ovaries in 500 ||L of cold EBR in a dissection dish. After dissecting approximately five females, transfer the group of ovaries to an Eppendorf tube on ice containing 1 mL EBR. Continue dissecting in groups of five until all the females have been dissected. 4. Digest the ovaries at room temperature in 1 mL of 5 mg/mL collagenase diluted in EBR with rocking for 15 min. After the incubation is complete, rinse the ovaries several times with EBR to remove residual collagenase. This is best accomplished with a Pasteur pipet (see Note 4). 5. Resuspend the ovaries in 300-500 |L of 1X nuclear isolation buffer with 1.5% NP-40. Using a Pasteur pipet, transfer the ovaries to a 2-ml Dounce homogenizer. Homogenize the ovaries for 10-30 times with a pestle that has a clearance of 0.0005-0.0025 inches. It is not necessary to disrupt the eggshell of older egg chambers. 6. To remove large particulate matter from the solution, including eggshells, filter the homogenate twice through a 100-|im Nitex mesh (see Note 5). 7. Add DAPI to a concentration of approx 1 | g/mL and incubate for 5 min at room temperature. For a 500 |L sample, this will involve adding to the homogenate 0.5 |L of the 1-mg/mL DAPI stock solution. The DAPI is used to follow the nuclei in the next steps. 8. Build a step gradient with the 0.8-M, 1.6-M, and 2.5-M sucrose solutions in nuclear isolation buffer, starting with 2.5 M and finishing with the 0.8-M solution on top. We use 300-500 |L for each step in Beckman 11 x 34-mm polyallomar centrifuge tubes. It is important not to disturb the layers when making the gradient. After making the step gradient, three defined layers should be clearly visible when holding the tube up to a light. 9. Gently layer the homogenate on top of the sucrose step gradient, taking care not to disrupt the layers. Centrifuge for 20 min at 20,000g in a swinging-bucket rotor. We use a Beckman Optima TLX Ultracentrifuge. Check that the nuclei have pelleted by examining the tube under an ultraviolet (UV) light source. You should see a small pellet of DAPI-bright material at the bottom of the tube. 10. Remove all but 50-100 |L of the sucrose gradient, being careful not to disrupt the nuclei. Resuspend the pellet in 500 |L of nuclear isolation buffer. Disrupt the pellet by pipetting the nuclear isolation buffer up and down several times using a 1 mL Pipetteman. To ensure that the pellet has been resuspended, examine the tube with a UV light source. 11. Add 0.5 |L of the 1-mg/mL DAPI stock solution to obtain a final concentration of 1 |g/mL. Alternatively, nuclei can be stained with propidium iodide (see Note 6). 12. Store nuclei on ice before sorting. If necessary, nuclei can be stored overnight at 4°C. 13. To obtain a flow cytometry profile, examine the DAPI-stained nuclei excited with a krypton laser with a multiline UV (337-356 nm) source. 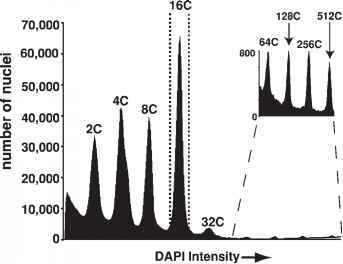 DAPI emission is collected through a 450/465 bandpass filter. Specifically, we use a Coulter EPICS 752 flow cytometer.